The Martian was released into theaters on Friday. It’s a great film! Yet again, we have put Matt Damon into a dangerous situation that requires a rescue! So, I want to know: How much has makind spent trying to save Matt Damon? Interstellar cost $165M to create. It earned $188M in North America and another $487M abroad. Another $36M on at home video sales. [ref] That brings Interstellar’s total to $876M to watch Matt Damon get saved in 2014. On Friday, The Martian was released. It’s hard to say how much it will earn. It cost $108M to create and it’s projected to earn $55M it’s opening weekend. [ref] So we’ve spent at least $163M already. Now, I’m not a box office predictive analyst, but I think the movie is great. The book is great too. (As an aside, I highly recommend both of them!) And so it is with an optimistic heart that I say: Let’s assume, for the sake of argument, mankind will spend approximately $600M in total on The Martian. If we are so willing to throw that much money at a fake situation, then why don’t we have a real mission to Mars? Why can’t we really do this? Surely we could edit together a documentary or reality TV version of astronauts on Mars? I guess what I’m really asking is: How do these expenses relate to a real situation? Let’s restrict our scope to just having a manned mission to Mars. As it turns out, the cost of an actual Manned Mission to Mars has been computed. NASA estimates the overall expenditures at about $100 billion over 30 or 40 years says Brent Sherwood of NASA’s JPL. Now, if you know the plot, you might argue that The Martian required the resources of 2 manned missions to Mars. Or at least 1.5 missions. So, let’s say we could spend approximately $175 billion to do The Martian for real. 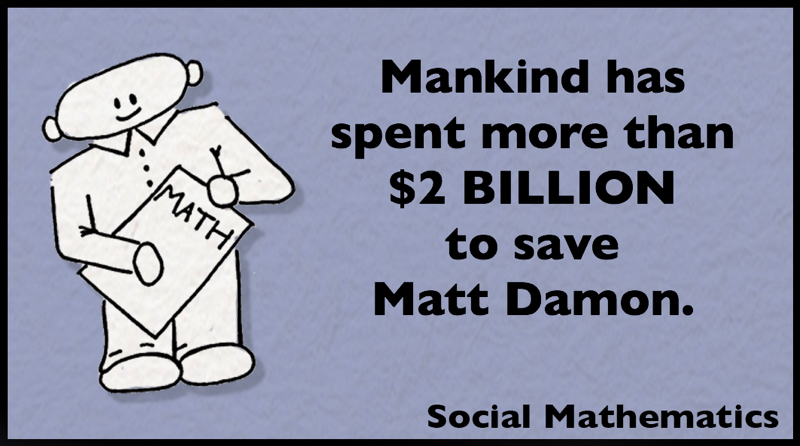 In conclusion, we can fake save Matt Damon 3 times for $2 billion or we could really save him once for $175 billion. Fake saving him costs 1% of the true cost of putting a real human in that real situation. So until we make 297 more blockbuster movies about saving Matt Damon, we will not get close to reaching the actual cost of space travel. Turns out there is quite a high cost for the actual science; and actual science is not required for a film set! This entry was posted in Business, Movies & Books and tagged Books, Box Office, FIlms, Interstellar, math, Matt Damon, Movies, Sales, Saving Private Ryan, The Martian. Bookmark the permalink. This is such an amazing post! I really love your blog so much and in turn cannot stop reading all of your posts. Please don’t ever stop writing them because I love your posts too much! P.s. Saving private Martian is so smart!